On the day where we wonder what role Andy Halliday may now play with a returning Borna Barisic back in the action, we now wonder, in an opposite sense, if Barisic’s countryman Nikola Katic has also played himself back into contention. The 21-year old colossus found himself on the receiving end of Gerrard’s brutal hammer when the Croat was ditched for Joe Worrall deep into the season, having become a huge fan-favourite for his work ethic, power, attitude and willing to hurt for the side. He could also more than play a bit too. His main ‘return’ to action was on Hamilton’s plastic turf and he absolutely struggled with the match, as did his team mates, despite the score, and was hauled off for aforementioned Worrall around 79 minutes. Since then he’d barely been seen in a Rangers jersey, and that was a full three months ago. 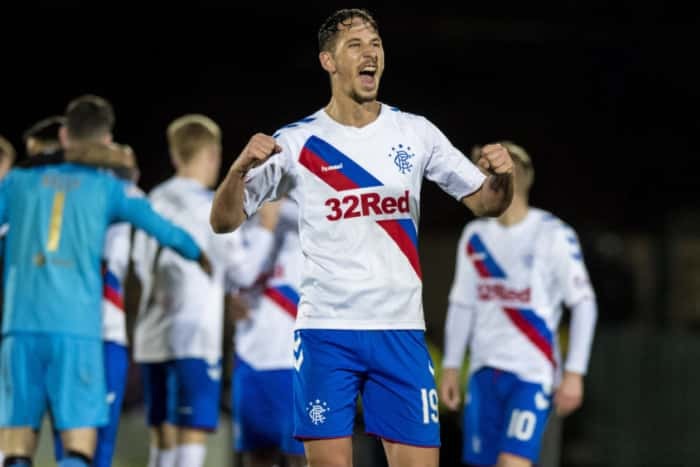 And while we wouldn’t say Paolo Maldini appeared in the blue yesterday, Katic’s reintroduction to frontline action went a hell of a lot better on Livi’s synthetic surface than it had at Martin Canning’s place, and Katic looked far more assured, comfortable, and happier than he’d been before. He appeared aching to take his chance, and he did seem to achieve this. True, Livi’s attack was hardly potent, and Menga wasn’t as dangerous as he was when Holt’s men took all three points last year at this same venue, but what Katic did he did well, aside being pulled naively out of position now and then. He looked better at reading the game, more assured during physical battles, and more able aerially. He always said his favourite part of defending was tussling for aerial balls, and he was far more assured in that aspect yesterday. He has also now given his manager a real problem. Or solution, depending how you look at it. Connor Goldson seems medium-termed injured – we’re not clear on when he returns. Gareth McAuley and Joe Worrall are the only other two available defenders, so Katic’s return to competitive action is well-timed, and means in the ex-Brighton man’s absence Gerrard now realistically has three stoppers to choose from. The problem is choosing which two to stick with. But Katic sure has put his hat in the ring for that now. Definetly a solution. A long long overdue recall! Macaulay/Katic until goldson is fit. Really had nothing to do against a very impotent Livi attack. I think even Cribari would've strolled through that game. Nice to see the big man back in the frame though and a clean sheet doesn't do his stats any harm. i keep saying it.......send worrel back south....they should have had a penalty against worrel....a definite shove in the box....he could have caused points again, if it was evenly balanced. Worrall should be Given a Train Ticket back to Nottingham!